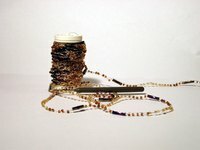 The art of creating handmade beaded jewelry is a successful hobby or business when the crafter masters tying knots in beading wire. Fine beading or jewelry wire must be made secure with knots to keep a bracelet, necklace or earrings from coming apart when a knot loosens. The simple half hitch knot works well for securing the ends of a beaded jewelry piece. The knot is also used for hand securing pearls and beads in a fine piece of jewelry. Hold the length of beading wire in your hand or outstretched on a flat surface. Take the loose end of the wire and bring it back toward the other side of the beading wire in a U shape. Cross the end of the wire over the other side of the wire to form a pretzel shape. Pull the open pretzel shape closed to form a loose or secure knot. The loose knot is tied when the project is in progress. A tight knot is tied for a permanent secure closure. Add beads and form a second pretzel shape to knot the other end of the jewelry piece. The half hitch knots can be secured between larger beads to add extra security to a necklace or bracelet string. Practice the half hitch knot with a piece of yarn before using it on beading wire.